Gene Selznick has 38-50+ career open victories (depending on who you talk to). To call Gene Selznick one of the greatest players in the history of volleyball is a disservice. Selznick was also a great innovator, a wonderful entertainer, an outstanding coach and an outspoken individual who first started playing the game in the sand when he was 18-years-old. Mixing his natural physical talents with skills he "copied" from players around the world, Selznick dominated volleyball like no other player during the 1950s and 60s. In 1995, Volleyball magazine called him the "Karch Kiraly of his era." He was a visionary whose efforts to change the way the game was played in the United States met with staunch opposition from the powerful United States Volleyball Association (USVBA) leadership at the time and led to the only regret he feels about a sport he loves so much when he was not allowed to participate on the US National Team that participated in the 1964 Olympiad. As a kid in 1948, Gene Selznick was a 6'2", 195 pound player that came down from Los Angeles to Hermosa Beach for his first exposure to beach volleyball. He quickly became too good for the local talent and eventually moved his game to Santa Monica where he eventually became the top player. After his first year on the beach, his friends Bernie Holtzman and Manny Saenz introduced him to the indoor game, and for that Selznick is forever grateful. In 1953 Selznick represented the United States internationally indoors for the first time and discovered that there were different, and perhaps better, ways to play the game. Indoors, by 1951 he made All-America, with the exception of 1952, a feat that he repeated through 1965. Selznick is one of the best indoor player to ever play volleyball. He was the first U.S. player to ever be named to the "All-World" Team. On the beach, Selznick was one of the all-time best players ever to play the game. The early beach volleyball tournaments were dominated by Gene "Monster Geno" Selznick, who by default had to be the first "King Of the Beach." Selznick would say that the players of today might want to be "king of the beach," so I must have been "king of the world!" His first "Open" tournament win came with Everette "Ev" Keller at the 1950 State Beach Men's Open. Selznick was successful on the tournament circuit with many players. He won with just about everybody that he paired-up with. His most successful teammates were, in chronological order, Don McMahon, Bernie Holtzman, and Ron Lang. With all three partners he was virtually unbeatable during pick-up games, as well as on tournament circuit. With McMahon he always won, but when he let it be known that he could win with anybody, McMahon broke-off their partnership. With Holtzman he won 18 out of 20 tournaments and with Lang he won over 20 events. In 1954, Gene Selznick talked Bernie Holtzman to come out of semi-retirement and team-up with him. Prior to teaming-up together on the tournament circuit, they had played in pick-up games together, winning most of the time. So Selznick felt that they would be successful in tournaments together. He was right, over a period of three years, Selznick and Holtzman won almost every game that they played in together. It is said that they never lost during the mid-week pick-up games and only finished out of first place twice, on the tournament circuit, finishing second when they lost in the finals. Their first tournament win together came in 1955, when they won every tournament that they entered together, including the 1955 State Beach Open. Just as they had in 1955, the team of Gene Selznick and Bernie Holtzman outclassed all of the 1956 competition winning almost every tournament that they entered. Their only loss came in the finals to Mike O�Hara and Don McMahon, at the Santa Barbara Tournament. Selznick and Holtzman won The 3 Santa Monica tournaments: State, Sorrento, and Muscle Beach. They also won tournaments at Laguna Beach, Corona Del Mar and San Diego. Holtzman and Selznick�s win streak came to an end at 1956 Santa Barbara Men�s Open. The event was won by O�Hara and McMahon. This was the tournament when Selznick drove back to "LA" after Saturday�s competition to witness the birth of his son Dane. He made it home in time, then on Sunday morning he drove back to Santa Barbara to continue competing in the tournament. They won the remainder of the 1956 tournaments together, including the inaugural Sorrento Beach Open, with President John F. Kennedy in attendance. 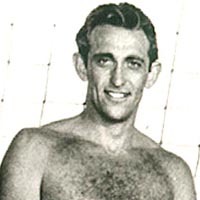 On the 1957 beach volleyball circuit, the team of Selznick and Holtzman, still outclassed all of the Open tournament competition, although they did not win every event that they entered they still won 6 of their 7 events together. They won at East Beach in Santa Barbara. They won all three of the Santa Monica events, winning at Sorrento Beach and the "Muscle Beach" event at the Pier, then outlasting the talented new duo of Ron Lang and Lee Grosscup at the celebrated State Beach event, when Greta Tyson "planted" that famous kiss on the face of Selznick. They also won tournament championships in Corona Del Mar and Laguna Beach. The 1957 San Diego Men�s Open was the last tournament that Selznick and Holtzman played in together as a team. At this tournament, Holtzman and Selznick lost for the second time as a team, after winning every tournament together, except the 1956 Santa Barbara Men�s Open. After this tournament, Selznick and Holtzman split-up, when Selznick decided to pair-up with the younger player, Ron Lang. During a 1999 interview, Selznick said: "I really enjoyed playing with Bernie, not only because he was a great player, but also because he was a very funny man." Selznick added: "Bernie was fun to play with and, other than winning, my main incentive for playing beach volleyball was to have fun." During their career together, Selznick and Holtzman entered 20 open tournaments, advancing to the finals at every event, recording 18 tournament championships together. Holtzman and Selznick are considered, by many players and spectators, to be the top defensive team of all time. They also started the most bitter and enduring feud in beach volleyball's history. The famed O'Hara against Selznick quarrel would continue for years to come! Gene Selznick and Ron Lang first played together in 1957, but their union did not work out. Selznick would team-up with Lang again in 1958 after the great Bernie Holtzman called it quits. Selznick and Lang would work-out together for hours hitting the ball until they were too tired to continue, then they would serve balls until they were rested enough to work on hitting again. As a team they were dazzling, after a second at the Santa Barbara Open they went on to win the Laguna Open. They continued their winning ways the remainder of the season. On defense Selznick was years ahead of his peers. They "broke-up," as a team, in 1959 and 1960 because of a National Guard commitment by Lang. They tried to recapture their dominating style in 1961, but Selznick had lost his intensity on the beach. They were still the best on the beach and won more than they lost.